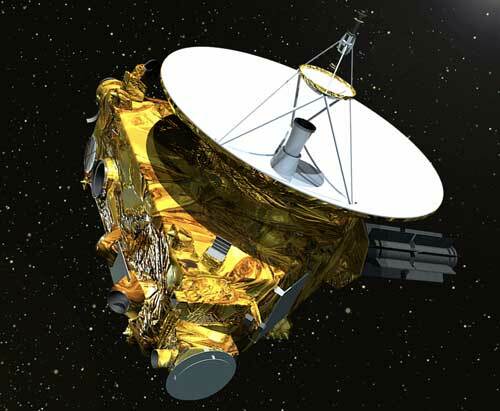 (Nanowerk News) Images taken by NASA's New Horizons mission on its way to Pluto, and now the Kuiper Belt, have given scientists an unexpected tool for measuring the brightness of all the galaxies in the universe, said a Rochester Institute of Technology researcher in a paper published this week in Nature Communications ("Measurement of the Cosmic Optical Background using the Long Range Reconnaissance Imager on New Horizons"). In the study, lead author Michael Zemcov used archival data from the instrument onboard New Horizons--the Long Range Reconnaissance Imager, or LORRI--to measure visible light from other galaxies. The light shining beyond the Milky Way is known as the cosmic optical background. Zemcov's findings give an upper limit to the amount of light in the cosmic optical background. "Determining how much light comes from all the galaxies beyond our own Milky Way galaxy has been a stubborn challenge in observational astrophysics," said Zemcov, assistant professor in RIT's School of Physics and Astronomy and member of RIT's Center for Detectors and Future Photon Initiative. Light from the cosmic optical background can reveal the number and location of stars, how galaxies work and give insights into the peculiar nature of exotic physical processes, such as light that may be produced when dark matter decays. Dark matter is the invisible substance thought to comprise 85 percent of matter in the universe. "This result shows some of the promise of doing astronomy from the outer solar system," Zemcov said. "What we're seeing is that the optical background is completely consistent with the light from galaxies and we don't see a need for a lot of extra brightness; whereas previous measurements from near the Earth need a lot of extra brightness. The study is proof that this kind of measurement is possible from the outer solar system, and that LORRI is capable of doing it." Spacecraft in the outer solar system give scientists virtual front-row seats for observing the cosmic optical background. The faint light from distant galaxies is hard to see from the inner solar system because it is polluted by the brightness of sunlight reflected off interplanetary dust in the inner solar system. Cosmic dust is sooty bits of rock and small debris that moved, over time, from the outer solar system toward the sun. Scientists launching experiments on sounding rockets and satellites must account for the dust that makes the Earth's atmosphere many times brighter than the cosmic optical background. NASA's New Horizons mission has been funded through 2021, and Zemcov is hopeful for the chance to use Long Range Reconnaissance Imager to re-measure the brightness of the cosmic optical background. "NASA sends missions to the outer solar system once a decade or so," Zemcov said. "What they send is typically going to planets and the instruments onboard are designed to look at them, not to do astrophysics. Measurements could be designed to optimize this technique while LORRI is still functioning." Zemcov's method harkens back to NASA's first long distance missions Pioneer 10 and 11 in 1972 and 1974. Light detectors on the instruments measured the brightness of objects outside the Milky Way and made the first direct benchmark of the cosmic optical background. "With a carefully designed survey, we should be able to produce a definitive measurement of the diffuse light in the local universe and a tight constraint on the light from galaxies in the optical wavebands," Zemcov said. Archived data from New Horizon's Long Range Reconnaissance Imager show "the power of LORRI for precise low-foreground measurements of the cosmic optical background," Zemcov wrote in the paper. Chi Nguyen, a Ph.D. student in RIT's astrophysical sciences and technology program, mined data sets from New Horizons' 2006 launch, Jupiter fly-by and cruise phase. She isolated four different spots on the sky between Jupiter and Uranus, captured in 2007, 2008 and 2010, that met their criteria: looking away from the solar system and looking out the galaxy.